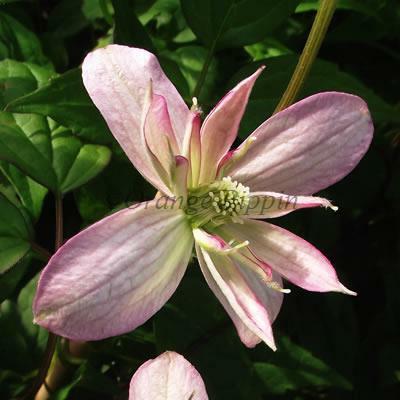 Clematis montana 'Marjorie' is a fast growing, non-evergreen climber with semi-double, creamy-pink flowers with salmon-pink centres during the late spring and early summer against green, tinged bronze leaves. Clematis montana 'Marjorie' was raised by Majorie Free of Suffolk, England. It was introduced by Jim Fisk of Fisk's Clematis Nursery, Suffolk, England. This Clematis is ideal for covering walls, fences, or unsightly buildings provided adequate support is in place.